A Central Reserve Police Force jawan on Friday shot dead his officer and a member of the All Assam Students' Union and injured four colleagues when they were out on an operational task in Nalbari district of Assam. Officials said the incident was reported from the Badrakusi-Tihu area in the district where a platoon of the 136th battalion of the CRPF was out on duty along with the local police. They said the accused jawan, Head Constable Amal K Das used his service weapon to shoot at his officer and Assistant Sub-inspector D C Bandolai and All Assam Students' Union member Himangshu Tamuly. "Bandolai was killed on the spot while four others who sustained bullet injuries have been sent to a hospital in Nalbari. Das tried to kill himself after the incident with the same weapon but he was overpowered," a senior CRPF officer said. The injured troopers have been identified as constables Mohale Janardan of Maharashtra and Diganto K Banya of Assam, Head Constable Dayaram Bandaloi and ASI Nirmal Das, both residents of Assam. An eyewitness informed that a group of protestors led by the AASU were blocking the national highway near Tihu in Nalbari district to press for their demand for creation of a sub-division in Tihu while a joint team of CRPF and Assam Police was keeping watch. Suddenly, Das opened fire on his colleagues, killing the ASI and the AASU member. 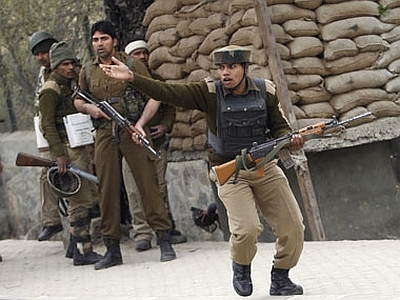 The CRPF jawan was also critically injured in retaliatory fire by his surprised colleagues. Eyewitness said that the casualties could have been more but for the swift handling of the situation by Additional Deputy Commissioner M N Baruah, who swiftly prevented the rampaging jawan from reloading his weapon. Senior officials of the paramilitary and local police have reached the spot even as CRPF has ordered a Court of Inquiry into the fratricidal incident. The force is deployed in the state for assisting local police in rendering law and order duties while some of its special units also conduct special counter-insurgency operations.